‘It’s rattlesnake season,’ the woman rescuing us said, as she and her golden retriever led the way back over the red rocks, through the juniper trees, sweetly scented sage bushes and tangled yews to the Sedona trail head where we had parked our car a couple of hours earlier. We weren’t exactly lost. We were concerned. Darkness was falling and we realized we hadn’t taken the trail we intended, and the likelihood of getting really lost was quite high. ‘You know some rattlers have up to 30 babies, and they come out when it gets dark,’ our savior continued. Did I mention it was getting dark? The darkness in Sedona can be total. Nothing but inky black and a swoosh of shimmering stars. But in two hours time, the three of us – Loredana, her sister Giussepina, and I – would head off again up a different mountain trail in the pitch dark; scaling Cathedral Rock to a plateau where we’d heard a drum circle was meeting to greet the new moon. A harvest moon. We could already hear the whoops and the drums as we scrambled up with the aid of two headlamps and my rather puny bike light (note to self – must get a headlamp). We didn’t see or hear a rattler that night or any other night. And standing triumphantly on the plateau with a 360 view of the horizon, and haloed by the moon -it felt like we could see the curve of the planet. And I felt linked to all of time – all that was and is. Almost exactly four years earlier, I’d stood in the exact same place listening to the drums and the whoops as I played the clave sticks, beating out a tune to welcome another full moon in Sedona. It was the year after Laura passed. Sedona is my go-to place for healing. It’s gentle pulsing energy soothes my heart and soul and connects me profoundly to the divine. I feel restored to my true self. And I cherish it’s magical powers. The first time I visited Sedona, in 2010, I scaled Bell Rock, passing the twisting yew trees that seem to dance in the divine energy. And I sat on the pink belly of the bell-shaped rock. I felt such tingling running up and down my spine as I sat in awe of the energy that shoots up out of the landscape. I had only two hours to enjoy it, but I vowed to return. After Laura died, I returned. Everyday I hiked and lay out on the red rocks, feeling their soothing energy pulse through me. And little by little I felt restored. My heart opened again and one night watching one of the spectacular firey sunsets that nightly crown Chimney Rock, I saw a flicker of pink on the path in front of me. Well I didn’t see it. It appeared in three of my photos (See post Think Pink!, October 24, 2014). It felt like Laura was beside me, leading me on. And as the sun bled out into the sky and escaped, the tears poured down my cheeks. I felt like I was saying goodbye to Laura all over again. And finally letting all the pain and suffering out. 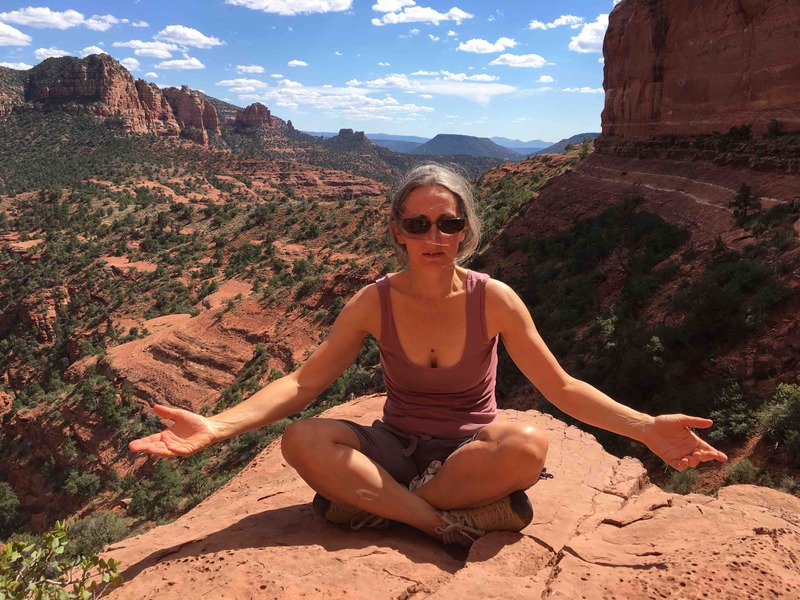 This September, four months after mum died, I visited Sedona again with a heavy heart. On the first day, after hiking the Boynton Canyon trail to the Warrior Man rock my old friend Robert appeared and gave me a heart shaped red rock. ‘Press it to your heart, ‘ he instructed. I did and it instantly began blotting away the pain, easing the aches and the sadness inside. As our week progressed i felt lighter and lighter. I watched a couple of sunsets and wondered if they would make me cry. They didn’t. 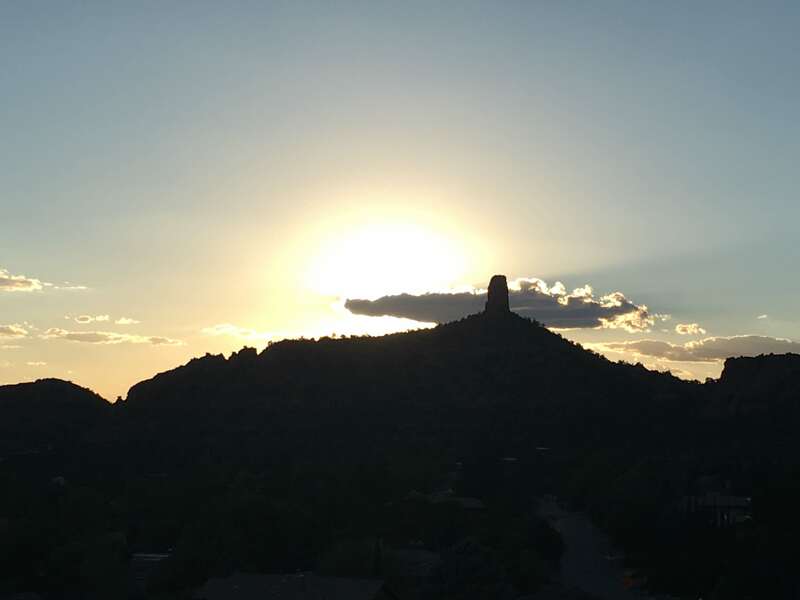 On the last morning I took my green tea outside, as I did every morning, to watch the sunrise turn Chimney Rock into a glowing orange pinacle pointing to the heavens. Everything in the terraced garden was edged in gold and the horses on the ranch were out stretching their legs. I sat and watched. And then the tears came. Not pain exactly, but a clearing – a release. An easing of all the suffering. And a celebration too. Of mum as she was and is. The magnificence of her being casting her golden glow over her family even now. I laughed and smiled. She is such a beautiful presence in my life. And I have only gratitude.